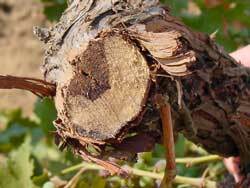 Grapevine trunk diseases (aka wood-canker diseases) are widespread throughout all of California’s grape-growing regions. This disease complex includes: Botryosphaeria dieback (aka Bot canker), Eutypa dieback, Phomopsis dieback, and Esca (aka Measles, Young vine decline, Petri disease). 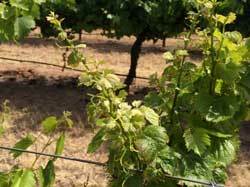 Every California vineyard is eventually infected by one predominant trunk disease or a combination. These diseases significantly reduce yields in mature vineyards by either killing fruiting positions (main impact of the dieback-type diseases) or decreasing vine vigor (main impact of Esca). These impacts accumulate each year, as there are no effective methods to eradicate the wood infections. As such, diseased vineyards must be replanted prematurely. 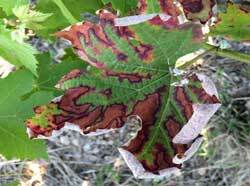 If adopted in young vineyards, preventative practices can reduce these negative effects. 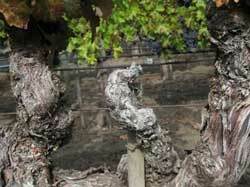 On this site you will find useful figures and tables from an economic analysis of early adoption of three field-tested, preventative practices (delayed pruning, double pruning, and application of pruning wound protectant) that will help you understand the potential costs and benefits from adopting trunk disease preventative practices in young winegrape vineyards. You will also be able to enter economic and yield data for your operation to see how trunk diseases and these preventative practices might affect your vineyard. This research is part of a trunk disease project funded by a Specialty Crop Research Initiative (SCRI) USDA, National Institute of Food & Agriculture grant. For inquiries about the page and economic analysis of trunk diseases in California winegrape vineyards, please contact kaplanj@csus.edu. Partial support for this site is provided through grants from the California Department of Agriculture’s Specialty Crop Block Grant program in partnership with the California Sustainable Winegrowing Alliance and the Specialty Crop Research Initiative (SCRI) USDA, National Institute of Food & Agriculture. For more information on trunk disease research, please visit the SCRI Trunk Disease Project Page. The input form below shows the settings for the price per ton for Cabernet Sauvignon grapes, the discount rate, annual additional cost of double pruning per acre, annual cultural cost per acre for selected vineyard ages, and yield per acre for a Northern San Joaquin vineyard. You may use these default values or select another region evaluated in our analysis, and where you vineyard may be is located or is closest in growing conditions to your vineyard. In addition, you can enter your own yield, price, cultural cost, and preventative practice cost information in the input form and hit submit to generate figures and tables based on your winegrape vineyards and our economic framework. Links throughout the site provide additional information about the preventative practices, disease control efficacy rates, and definitions of the variables displayed in the figures and tables. Changing this setting will reset all parameters to the default values for this region. Select at least one year. These years were selected following grower interviews and discussions with viticulture farm advisors to reflect key stages in a vineyard’s lifespan. Year 3: Vines fully trained onto the trellis system, winter pruning begins. Year 5: Vines reach maturity. Year 10: Trunk disease symptoms typically appear. Yield (in tons per acre) over the vineyard's 25-year lifespan, at various disease control efficacy rates. 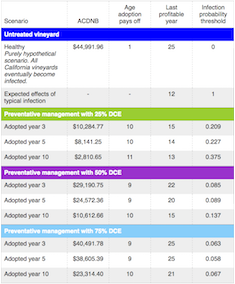 Cumulative discounted net returns (in thousands of dollars per acre) across each year of the vineyard's 25-year lifespan, at various disease control efficacy rates. For missing values, perform calculations with Northern San Joaquin Napa Lake Sonoma Central Coast default values. Change to another regions to see the default settings from the economic analysis in the table below or enter your own numbers below and hit submit to generate figure and table results. 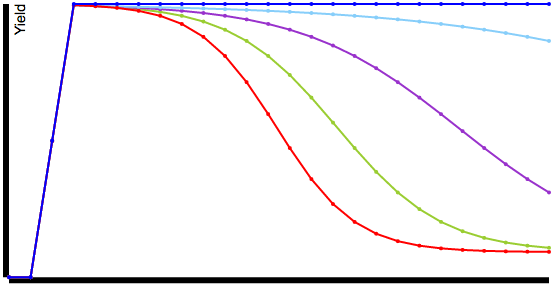 The value of a payoff, or cost, expected on some given future date is diminished by the discount rate for each year intervening between the date of payoff and the present. To assume a discount rate of 0% would imply, unrealistically, total indifference between receiving a payoff now and at any other time; in the U.S. a more suitable assumption is 3%, a benchmark found in typical studies of government-financed projects. At this rate, the expectation of receiving $100 in one year has a value approximately equivalent to $97 today. The additional cost of delayed pruning is assumed to be zero as it does not cost more to shift when this practice is performed. The additional cost per acre for hand-painting TopsinM and double pruning are shown in the tables below. Currently, protectants registered for hand application during the dormant season in California are Thiophanate-methyl (Topsin M WSB; United Phosphorus, Inc., King of Prussia, Pennsylvania), Boric acid (Tech-Gro B-Lock; Nutrient Technologies, Inc., Dinuba, California), and VitiSeal (VitiSeal International LLC, San Diego, California). We only evaluated TopsinM in our analysis as there were field trials using this protectant that provides evidence of effectiveness. Note, the default costs include material, labor, and labor overhead costs.